Crocodiles have always played a part in human culture. While being worshipped as holy creatures in some regions, crocodiles were hunted for their meat, skin elsewhere. Apart from food, products were also used for medical, religious or decorative purposes. The first records of commercial use of crocodilian skins are to be found in North America in the 1800s. Right after the Civil War (1861-65) the demand for footwear in particular, but also for belts, saddlebags, cases and similar items, was high. Thus, tens of thousands of American Alligators (Alligator mississippiensis) were hunted and processed in local tanneries. Since demand exceeded the wild alligator resource, the harvest was also directed to other species of crocodile further south (Mexico and Central America). Due to the presence of osteoderms (bone) in the belly skins of caimans, these species were not used. The effects of extensive, unregulated hunting were devastating for wild populations, with most populations being greatly depleted. After the Second World War and during the subsequent economical revival, crocodilian skins were again in demand. In Africa, Nile Crocodiles (Crocodylus niloticus) were hunted in high numbers. In South and Southeast Asia, as well as in Australia and the Pacific islands, wild populations of Saltwater Crocodiles (C. porosus) and other crocodile species were systematically reduced, to satisfy European markets. In South America, the commercial hunting of caimans began in the late 1950s, beginning with the Black Caiman (Melanosuchus niger), whose skin is regarded as the most valuable of the caimans. When wild Black Caiman populations dwindled and hunting was not profitable, other caiman species (mainly Caiman crocodilus in the Amazon basin) were targeted. The skins of some species (eg Dwarf Caimans, Paleosuchus spp.) were not commercially valuable due to large bony deposits, and so were not hunted except for subsistence use by local people. However, this extensive, worldwide exploitation during the 1950s, 1960s and 1970s resulted in the populations of most species being greatly reduced, and in some cases being extirpated from parts of their range. With declining wild populations in the 1960s and 1970s, the concept of crocodile farming began to take momentum. It was also at this time that many countries enacted legislation to protect crocodilians, and CITES was enacted (1975) to regulate trade in wild species. Crocodile farming was seen not only as a way to reduce pressure on the wild populations, but also as a means through which commercial incentives for the conservation of crocodilians could be generated. By the late 1970s and 1980s many programs were being developed, based on the sustainable use of crocodilians to generate conservation benefits, including C. niloticus (Zimbabwe), C. porosus (Australia, Papua New Guinea, Indonesia), A. mississippiensis (USA), Caiman crocodilus (Venezuela) and C. novaeguineae (Papua New Guinea, Indonesia). The term “crocodile farm” is used to describe any facility that breeds and/or grows crocodilians for commercial purposes. Strictly speaking, a “crocodile ranch” is a facility that collects wild eggs, hatchlings and/or juveniles that have a low probability of surviving to adulthood, and growing them in captivity. From a CITES perspective, three production systems apply to crocodilians: ranching, captive breeding and wild harvest. As all species of crocodilian are listed on the CITES Appendices, international trade is regulated. Countries that are signatories to CITES, and which utilize wild crocodilian resources, must demonstrate that the use does not threaten the survival of the species (non-detriment). This typically involves some sort of monitoring of the wild population to assess the impacts of use, and regulation of products in trade. For example, all crocodilian skins in international trade must have a uniquely numbered, non-reusable tag attached to them - this allows “legal” skins to be readily identified. International trade in CITES Appendix-I species is prohibited, except for closed-cycle captive breeding which has been established without detriment to the wild population. In order to trade internationally, such facilities must be registered as “CITES-registered captive breeding operations”. Captive breeding facilities are established for a number of crocodilian species, including A. sinensis, C. moreletii, C. acutus, C. porosus and C. siamensis. 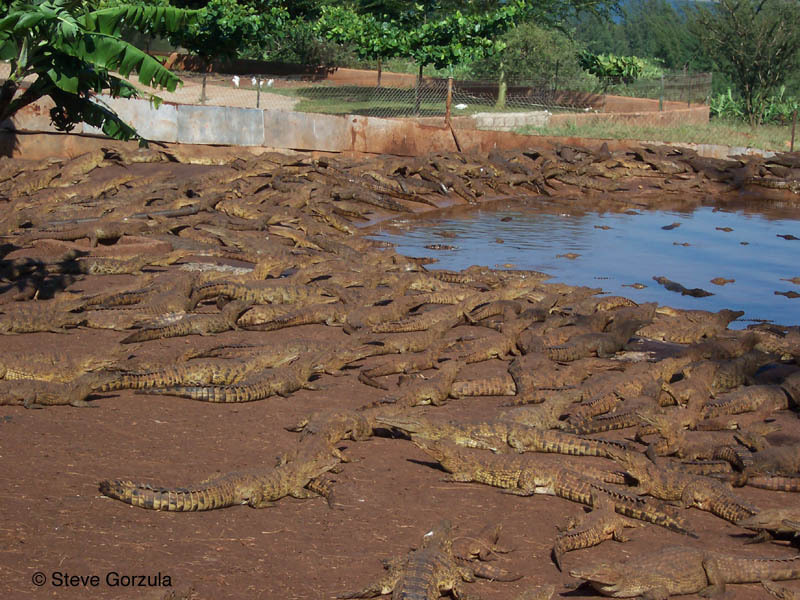 Crocodile farming is a form of intensive animal husbandry. Raising requirements are similar for all crocodilian species, although some aspects vary and are species-specific. For example, the Siamese Crocodile (C. siamensis) is considered a good “farm” species relative to the Saltwater Crocodile (C. porosus). The latter is much more territorial and aggressive. A general guide to the farming of crocodilians was compiled by Jon Hutton and Grahame Webb (see Recommended Reading). Unlike conventional domesticated animals, that are raised for their meat and leather is a by-product, the main product from crocodilians is the skin, and meat is a by-product. For this reason, care is taken during rearing to minimize damage to the belly skin, either from the substrate surface or from social interactions with other crocodiles. The density at which crocodiles are maintained is reduced as they grow larger, to reduce interactions between individuals and to promote growth. The relative value of the skin of different crocodilian species depends on a number of factors. The degree of ossification (bone) in the belly is a key factor that separates the “classic” skins of crocodiles from caimans. The skin of the Saltwater Crocodile is considered the best in the world, as there is no bone in the belly scales, but also because of the high number of belly scale rows in the belly. That the species grows large is also a positive characteristic. Following removal of the skin at the time of culling, it is cured with salt - this prevents the skin from rotting. At the tannery, the first step to converting the skin into leather is soaking, to restore the skin to its former state. Then the keratinous scales are removed, and a series of chemical processes are undertaken to convert the skin to leather, which can be dyed and made ready for manufacture into products (see Fuchs 2006). These processes may vary according to species. Although there are tanneries dealing with crocodile skins throughout the world, considerable expertise with the highest quality crocodilian leather products is in Singapore, Japan and Europe (eg France, Germany, Italy). The current international trade involves over 1.5 million crocodilian skins per year, exported legally from about 30 countries. CITES trade records from the UNEP World Conservation Monitoring Centre (WCMC), and trends in crocodilian skin trade are regularly summarized (eg Caldwell 2014, 2015; see Suggested Reading). Between 2011 and 2013, international trade averaged 1.57 million skins per year, comprised of 47% classic skins and 53% caiman skins. The Global Financial Crisis (2009-2010) resulted in reduced demand for crocodilian products generally, although the market for the very highest quality products remained strong. In terms of volume, the main species in international trade (and main producer countries) are C. niloticus (Africa), C. siamensis (Thailand, Vietnam, Cambodia), C. porosus (Australia, Papua New Guinea, Indonesia, Malaysia, Singapore, Thailand), C. novaeguineae (Papua New Guinea, Indonesia), C. acutus (Colombia, Honduras), C. moreletii (Mexico), C. crocodilus (Colombia, Bolivia), C. yacare (Brazil, Argentina, Bolivia), C. latirostris (Argentina) and A. mississippiensis (USA). Table 1. World trade (1000s of skins) in classic crocodilian and caiman skins, 2006-2013 (source: Caldwell 2015). The main by-product of crocodilian farming is meat. Between 1990 and 2005 meat exports were relatively stable, at around 400 tonnes per year, derived mainly from American Alligators, Nile Crocodiles and Siamese Crocodiles. China and Hong Kong are the main importers of crocodile meat. Other crocodile parts are also utilised, including blood (pharmaceuticals), bones, fat (traditional medicines), teeth, heads, skulls (tourist curios), etc. Minor trade in live crocodilians occurs between zoos and for the pet trade. On a larger commercial scale, live crocodiles are exported for farming (eg 268,000 hatchling Nile Crocodiles from Mozambique to Zimbabwe and South Africa over a 7-year period; Siamese Crocodile hatchlings from Cambodia to Vietnam and Thailand) or for the food trade (eg 466,000 juvenile Siamese Crocodiles from Cambodia, Vietnam and Thailand to China between 1998 and 2008). Caldwell, J. (2014). World Trade in Crocodilian Skins, 2010-2012. UNEP-WCMC: Cambridge. Download. Caldwell, J. (2015). World Trade in Crocodilian Skins, 2011-2013. UNEP-WCMC: Cambridge. Download. Fuchs, K. (2006). The Crocodile Skin: Important Characteristics for Identifying Crocodilian Species. Edition Chimaera: Frankfurt am Main. Hutton, J. and Webb, G. (2002). Legal trade snaps back. Pp. 1-10 in Crocodiles. Proceedings of the 16th Working Meeting of the IUCN-SSC Crocodile Specialist Group. IUCN: Gland, Switzerland. Hutton, J. and Webb, G.J.W. (2003). Crocodiles: legal trade snaps back. Pp. 108-120 in The Trade in Wildlife: Regulation for Conservation, ed. by S. Oldfield. Earthscan Publications: London. Jelden, D. (2004). Crocodilians and the Convention on International Trade in Endangered Species of Wild Fauna and Flora (CITES): Pp. 66-68 in Crocodiles. Proceedings of the 17th Working Meeting of the IUCN-SSC Crocodile Specialist Group. IUCN: Gland, Switzerland. MacGregor, J. (2002). International trade in crocodilian skins: Review and analysis of the trade and industry dynamics for market-based conservation. Pp. 12-18 in Crocodiles. Proceedings of the 16th Working Meeting of the IUCN-SSC Crocodile Specialist Group. IUCN: Gland, Switzerland. Webb, G.J.W. (2004). Article IV of CITES and the concept of non-detriment. Pp. 72-77 in Crocodiles. Proceedings of the 17th Working Meeting of the IUCN-SSC Crocodile Specialist Group. IUCN: Gland, Switzerland.